dawnyoshi Kaiser Sea Horse is one of the few playable sea serpents out there, along with the Levia Dragon from IOC. 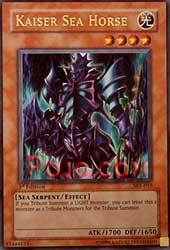 Sea Horse has an interesting effect, allowing you to sacrifice this monster for summoning something like Blue Eyes White Dragon. That's not bad, and it easily speeds up the summoning of high level light monsters. Mystical Knight of Jackel just got a few extra points. In the future, expect Sea Horse to be even better, when the release of Gilford the Lightning hits U.S shores. Until then, you have Mystical Knight of Jackel and Blue Eyes White Dragon. That should be good enough for now. Limited: 2/5- Sure, you'll be getting BEWD with this in sealed deck, but without two or three sea horses with you, he will end up being bait more than a useful monster. This card is actually DECENT. The new 2-trib Light monster, Guardian Angel Joan, can make very good use of this. Blue-Eyes for one sacrifice is also appealing. This card's stats are actually good. Control decks play a lot of lower ATK monsters. If Don Zaloog, Mystic Tomato, or the like attack this while it's face down, they won't be pleased. However, you can't search this card, and more than likely won't be able to search the monster you are attempting to summon using this card's effect. This means in order for the effect to work consistently, you'd have to play 3 of this, and more than 1 of the monster you want to get out onto the field. This card is a nice asset to an original Deck, but won't stand up to the cards in today's tournaments. Stats: Being a Sea Serpent is somewhat nice since there aren’t a lot of them, but it is also a bad thing because that means there is not a lot of Support. Being a Light Monster is also okay, since it is Light-type support. Being a Level 4 is fine-it can’t attack under Gravity Bind, but at least it can be normal summoned without Tribute. Its 1700 ATK is a bit low for the modern environment, but if (in my opinion) Konami is smart and starts to balance out monsters more, by capping ATK/DEF scores by level in a manner that doesn’t make all but 5 tribute monsters useless, 1700 would be an okay level for something with a beneficial attack. As for it’s Defense, it’s probably too high-1650 makes the card an illegal target for Witch of the Black Forest to search for. Even if you didn’t want to search for it, it is then too low to block most beatsticks safely. Card Text (Effects): Here’s the reason you play the card-it’s a two-for-one deal if you use it to Tribute summon a Light-typed monster. After all, one of the reasons people didn’t like to Tribute Summon was it was slower and that most of the time, especially for a two tribute monster, you’d be better summoning a third copy of the most beatsticks. Uses/Combinations: The monsters that are currently out that you can use this to Tribute Summon for legally are BEWD, Seiyaryu, Sanga of the Thunder, Hyzozanryu, Moisture Creature, Mystical Knight of Jackal, and Wing Weaver. For BEWD, Seiyaryu, and Hyzonryu I would think Lord of D/Flute of Summoning Dragon would work better, but I could be wrong. If you are actually insane enough to want to run a Gate Gaurdian deck, this, the Legendary Ocean, and the various recursion cards will make summoning all the require pieces less painful (but not by much). Sanga on it’s isn’t that bad-the effect is nifty, but only works once, otherwise it might be worth running. Wingweaver should only be played if you have a Fairy theme. I need a ruling to be sure, but based on the wording, you might be able to use this with one other monster to trigger Moisture Creatures Spell/Trap card destroying effect. Mystical Knight of Jackal might be the best use for it-it’s a decent Warrior that happens to be Light. Casual: 3.75/5-Fairly useful for Light themed decks… yes, I was nicer to Black Luster Soldier, but I was tired then-I over rated it by at least .5 in every category, probably more. Constructed: 3/5-Same as above, but such a deck is much weaker here. Whoa, déjà vu, but it is true-it will help the themed decks that make use of its effect, but it isn’t going to revolutionize most of them. Limited: 4/5-It comes in a Starter deck with has two targets for its use, and 1700 isn’t too bad for a level 4 in Draft. It is a supporting monster, but is there enough for it to support? I think it would have been better if you could just tribute it to special summon a Light monster that could be tribute summoned… as is, I don’t think it works for Blue-Eyes Toon Dragon, not that people play that, or some other special summon only. It’d have been nice if it worked for rituals, but it doesn’t.